Along with a record-low acceptance rate of 13.9 percent, Northwestern’s class of 2017 is the most diverse group of admitted students to date. For the first time in school history, more than a quarter of incoming freshmen are black or Hispanic, according to the offices of the provost and undergraduate admissions. About 1 in 10 students in the class of 2017 are from another country, the highest proportion yet. “This is by far our most diverse admitted group ever,” said Christopher Watson, dean of undergraduate admissions. Black and Hispanic students comprise 26.3 percent of incoming freshmen, an increase from 21.9 percent and 18.8 percent for the classes of 2016 and 2015, respectively. International students make up 8.3 percent of admitted students this year, rising from 6.9 percent admitted in 2012 and 5.8 percent in 2011. The combined percentage of black and Hispanic students has risen 7.5 percentage points since 2011. The percentage of international students has risen 2.5 percentage points over the same period. 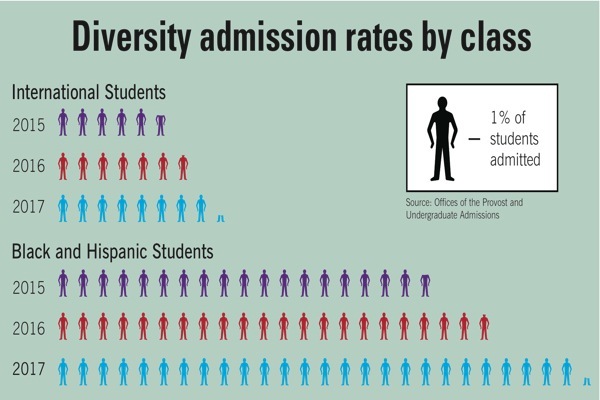 The admissions numbers come amid recent efforts by the University to attract more minority and low-income students. Last year, NU partnered with the Los Angeles site of the Posse Foundation, which pairs students from diverse backgrounds with elite schools. The class of 2017 will have the first 10 NU Posse scholars. The incoming class also has the highest number of students from Questbridge, a nonprofit organization that matches low-income students with scholarships at top-tier colleges and universities. Daniel Flores, president of NU’s Questbridge chapter, said the organization had visited more high schools to recruit potential Questbridge students in recent years. Tarik Patterson, a spokesman for black student organization For Members Only, said he doesn’t feel that NU has been successful in reaching out to underrepresented students in the past. The Weinberg senior recalled meeting with suburban Chicago students who didn’t know about NU until their senior year. Patterson said students are often more effective at recruiting their peers than admissions officials. He lauded the NU Ambassadors program, which works to recruit black students, and the Latino recruitment organization, the Council of Latino Admission Volunteers for Education. Over the last few years, Watson said the admissions office has been trying to expand NU’s off-campus presence, hoping to increase the number, quality and diversity of applicants. As a part of the strategy, Watson said the University has stepped up recruitment at high schools and increased overseas visits. Since 2007, when the admit rate was 27 percent, NU has seen a 10,000-application increase. This year, Watson said about 6,500 high schools were represented in the applicant pool — a few hundred more than last year. NU also received about 4,000 international applications. “That’s a testament to the idea that the Northwestern exposure is greater year after year,” he said. This year’s acceptance rate of 13.9 percent is a record low. It has been consistently declining, dropping 10 percentage points in the last four years. High school senior Amman Bhasin, who was just admitted to NU through Regular Decision, said he has noticed fewer people from his school in Fort Lauderdale, Fla., getting accepted. Though close to 20 people got in his freshman year, that number has dropped to five for his class. “I think its reputation is climbing year by year,” Basin said. Watson said the number of students graduating from high school each year in the United States is beginning to “level off,” and NU’s admit rate will likely follow suit. However, increasing numbers of international applicants, particularly from Asia, may impact the rate, he said.